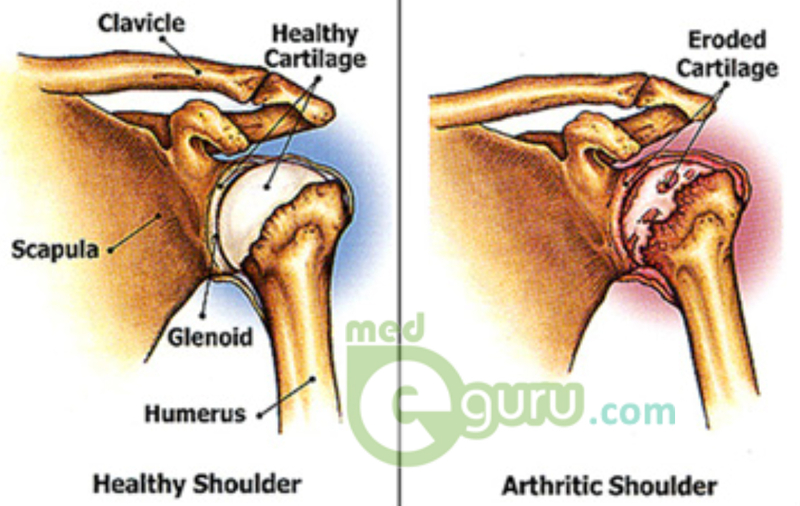 Pain: Pain is the most common symptom of shoulder arthritis. The patient will experience a shoulder pain which will get intense while engaging in physical activities. The pain will get worse as the condition gets severe. Limited range of motion: It is another common symptom experienced by a shoulder arthritis patient. When the condition gets severe, the patient will find it much difficult to lift up the arm. There can be a snapping, grinding or clicking sound while moving the shoulder. With the progress of the condition, the patient will feel pain while making any simple movement of the shoulder. Even the sleep may get disturbed due to night pain. The doctor will first evaluate the medical history of the patient. He/she will also have a thorough physical examination and check for the symptoms. If the doctor suspects for shoulder arthritis, he/she will then suggest for an x-ray. X-ray will be helpful to see whether there is a change in the bone, signs of bone spur formation or a narrowing of the joint space. Finally to confirm the diagnosis, the doctor may inject a local anesthetic into the shoulder joint. If it relieves pain temporarily, diagnosis can be confirmed. What about the risks, complications and recovery? Possible complications and risks of these surgeries are common with any other major surgical procedures. Some of them include infection, bleeding, blood clots, blood vessel damage and nerve damage. The surgery relieves pain and helps in restoring the normal functioning of the joint to an extent. Recovery and results may depend upon the type of surgery chosen.